The practice of "evidence-based medicine" aims at the conscientious, explicit and judicious use of the current best evidence in making decisions about the individualised patient care. The clinical genetics evolved from translational genetics research and contributes to the clinical care of patients and families through evidence-based health care in managing inherited disorders through accurate diagnosis, molecular pathology and assessing phenotypic correlations. Translational genetics and genomics research has led to the development of powerful tools for clinical diagnosis, assessing individual's genomic profile for disease prediction/prevention, high-throughput genome-wide screening for predisposition and/or protection to complex medical conditions, and discovery and development of new drugs and vaccines. Gene mapping and deciphering pathogenic mutations have helped in unravelling the basic biological mechanisms leading to new drug discovery and development. Targeted pharmacotherapy is now possible for managing the highly penetrant multi-system dominantly inherited conditions. Notable examples include rapamycin (sirolimus) in suppressing the mTOR pathway associated hamartomas in dominantly inherited cancer family syndromes and angiotensin converting enzyme receptor blockers (ACE-RB) in preventing aortic dilatation in Marfan syndrome and related familial arteriopathies. The translational genomic research is the essential prerequisite for developing sound evidence-based diagnostic, therapeutic and prognostic clinical protocols for the practice of personalised clinical medicine. Key words: evidence-based medicine, genomic medicine, translational research, personalized medicine, micro arrays, genetic testing, high-throughput genomic screening, pharmacogenomics, clinical trials. La pratica della medicina basata sull'evidenza (evidence-based medicine, EBM) mira all'utilizzo coscienzioso, esplicito e prudente della migliore evidenza attuale nel prendere decisioni sulla cura individuale dei pazienti. La genetica clinica rappresenta un'evoluzione della ricerca genetica traslazionale e contribuisce alla cura dei pazienti attraverso la gestione delle malattie ereditarie tramite diagnosi accurate, un approccio molecolare alle patologie e la valutazione delle correlazioni fenotipiche. La ricerca traslazionale genetica e genomica ha portato allo sviluppo di potenti strumenti per la diagnosi clinica, in grado di valutare il profilo genomico individuale per la predizione/prevenzione delle malattie, di effettuare un high-throughput screening sul genoma per la predisposizione e/o la correzione di condizioni mediche complesse, e la scoperta e lo sviluppo di nuovi farmaci e vaccini. La mappatura genetica e la decifratura delle mutazioni patogenetiche hanno contribuito a chiarire i meccanismi biologici di base che portano alla scoperta e allo sviluppo di nuovi farmaci. La farmacoterapia mirata è ora possibile per la gestione delle condizioni ereditarie ad alta penetranza. Esempi rilevanti includono il rapamycin (sirolimus) per la soppressione della via mTOR associata all'amartoma nelle sindromi oncologiche ereditarie dominanti e gli ACE inibitori, per la prevenzione della dilatazione aortica nella sindrome di Marfan e nelle arteriopatie familiari correlate. La ricerca traslazionale genomica è il prerequisito essenziale per lo sviluppo di solidi protocolli evidence-based, terapeutici e di diagnosi clinica per la pratica della medicina personalizzata. Parole chiave: medicina basata sull'evidenza, medicina genomica, ricerca traslazionale, medicina personalizzata, screening genetico ad alta resa, farmacogenomica, sperimentazione clinica. The philosophy behind the practice of "evidence-based medicine" (EBM) is not new. Its philosophical origins date back to the mid-19thcentury Paris or even earlier . Since its re-emergence, EBM has been hotly debated by clinicians, public health practitioners, health planners and commissioners, politicians and the public. It has now established a central position in the medical practice. The recent upsurge and interest about EBM was triggered in 1991 at the McMaster University in Canada that led to the North American initiative for EBM  and establishment of the British centres for evidence-based practice in Oxford and York with the Cochrane Collaboration . The importance of EBM was quickly appreciated leading to the launch of a dedicated journal: Journal of Evidence Based Medicine . The importance of the evidence-based practice and teaching is reflected in its incorporation in the policy planning and implementation in both undergraduate and postgraduate medical teaching and training . Since its early days the evidence-based practice has evolved as the widely acknowledged paradigm for the health care providers and consumers . Various databases and resources are now available on "evidence-based clinical practice" including the Agency for Health Care Research and Quality, Evidence-Based Practice, the Cochrane Library, the National Guidelines Clearinghouse, the National Institute of Clinical Excellence, and various other practice guidelines developed by the British Royal Medical Colleges and academic medical societies . The strength of EBM lies in the central dogma of individualised medical and health care. In this context, it is of paramount importance that the available evidence is based on sound bio-medical research. This article reviews the practice of EBM based on an individual's phenotype (disease pattern, symptoms and signs) and genotype (specific physiological and pathological genetic and genomic profile). This approach of personalised medical and health care has attracted the attention of health care providers, consumers, public and media. The personalised medicine is believed to be the practice of clinical medicine in the 21stcentury . From the time of Hippocrates and to the present day all medical students are diligently taught to elicit individual patient's family history, past medical history and corroborate this with clinical symptoms and signs. This individual evidence is collated with the external evidence based on the outcome of a number of laboratory and imaging investigations. Thus essentially EBM is truly the "personalised medicine". It is the acceptable form of "good medical practice". The practice of clinical medicine at a given time depends on several factors. The modern medicine evolved during the early 19thcentury and had to forcibly separate itself away from medieval practices that were largely influenced by several social, cultural and spiritual practices and beliefs. 6) the search for evidence of any difference in effect of age, gender, or subsites of disease. The success of evidence-based clinical practice depends upon the robustness of translational research. This is applicable to all kind of applications that exist today. It is well known that several clinical applications did not stand the test of time as these were not properly evaluated through the process of adequately regulated translational process. Several promising basic and clinical science discoveries are "lost in translation". The translation of scientific discoveries into clinical practice and the discovery of population-level health benefit have always been slow and difficult. It is estimated that only about 5% of the most valued and impressive research findings are actually licensed for clinical use and on average only about 1% remain in clinical practice . It is thus essential that the whole process of translational research is properly managed to ensure delivering reliable and clinically relevant outcomes. Khoury et al. recommend a framework for the continuum of multidisciplinary translation research to utilise previous research outcomes in genomics and related areas of health and prevention . 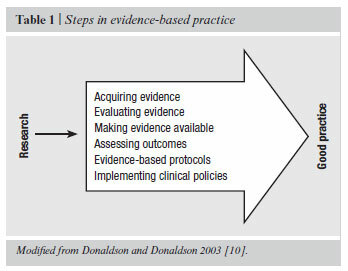 The whole process of the translational research includes four phases and revolves around the development of evidence-based guidelines (Figure 1). It is important to appreciate that the process of translation research leading to evidence-based guidelines is a dynamic process with considerable overlap between different stages. The process should be able to accommodate new knowledge that will inevitably arrive during translation research. Although evidence-based health practice is generally welcomed by clinicians, health professionals, health planners and health managers, it is not yet fully incorporated in all spheres of the medical and health profession. This is because of multitude of problems. One of the major hurdles is faced by clinicians on daily basis is selecting the best available evidence. It has been widely recognised that the clinical staff cannot be expected to undertake this evaluation themselves prior to undertaking clinical decisions across a busy practice. Increasingly, databases and information systems have been developed to provide topic-based summaries of research evidence which can be made available to health professionals. One of the established is the Cochrane Collaboration based in Oxford, England which now works with other international networks. The Cochrane Collaboration (www.cochrane.org/index.htm) prepares, maintains and disseminates systematic reviews of research, usually focussing on randomised controlled trials. One of the few initiatives on the corporation of genetics and genomics into EBM is the EGAPP (Evaluation of Genomic Applications in Practice and Prevention; www.egappreviews.org/about.htm) from the Centers for Disease Control and Prevention in the USA. EGAPP seeks to establish an independent, systematic, evidence-based process for assessing genetic tests and other applications of genomic technology as these procedures transition from research to clinical and public health practice. This process yields summaries of the effectiveness of treatments and other interventions in particular fields of care. In this way the clinician can obtain the information. The widespread use and the availability of the Internet facilities are crucial in developing, teaching and promoting EBM. The state sponsored organisations are equally effective in this approach. These institutions and organisation can examine the evidence and prepare clinical guidelines that could be useful to clinicians and health commissioners. In the United Kingdom the setting up of the National Institute of Clinical Excellence (NICE; www.nice.org.uk) has been a significant step in this direction. There are several clinically useful guidelines and protocols now available on the public domain of this institution that are regularly reviewed and updated. One of the fundamental principles of evidence-based medicine includes scientific understanding of anatomy and physiology in both holistic terms and as well as in individual parts. The human body is organised into organ systems, tissues, cells, and cell components that are reduced to genetic and genomic profile. The structure-function relationship in biological terms is ultimately dependent upon the genotype. The molecular dissection at the genome or gene level is thus fundamental to understanding the morbid variation in terms of anatomy, physiology and biochemistry. The scope of molecular and cell biology in medicine is unlimited as this encompasses practically whole of genetics and genomics. Genetics conventionally relates to specific genes in relation to a number of different traits and characteristics whilst genomics encompasses the whole genome including all genes, DNA polymorphisms, RNA and its varied forms, and all other polymorphisms that might have current or evolutionary biological relationships. Thus it is not surprising to encounter plenty of evidence around in support of the role of genetics and genomics in the understanding of both normal structure and pathologic changes in relation to practically all aspects of clinical medicine ranging from the most uncommon disorders to the most common medical diseases that afflict the humans. The pharmacotherapeutic approach has always been the centre point of medical or even surgical treatments. Even in ancient times, drug administration, whether in the form of herbal or mineral preparation or a combination, was tailored according to age, body size and gender. In a crude sense this was a personalised approach. This concept is evolving and is now firmly established as tremendous progress has been made over several hundred years. The knowledge gained from the personalised approach has also been successfully applied in the public and population health as evident by the use of vaccines, infection control, and nutrient supplementation to safeguard control and prevention of communicable diseases and to some extent control the rapid rise of non-communicable diseases like obesity, diabetes mellitus, coronary heart disease, and some form of cancer. With the completion of the human genome project and full sequencing of several other genomes, the medicine now has the best opportunity to take the treatment prospects to extreme limits, what is being enthusiastically described as genomic medicine (Figure 2) . Medical practice now comprises health promotion and disease prevention and is on the verge of transformation as the scientific and medical communities move from evidence- based medicine to genomic medicine. There is now enormous amount of genomic data available on various public domains. Information on the genetic basis of rare and common disease phenotypes can be found relatively freely on Medline and OMIM (www.ncbi.nlm.nih.gov/pubmed/OMIM). The focus is now understandably on common medical diseases that are termed complex diseases as the underlying pathogenesis is not usually fully understood but generally perceived to involve multiple factors including the pathogenic effects of polygenes, oligogenes, genetic polymorphisms, single nucleotide polymorphism (SNPs) and the copy number variations (CNVs). Thus evidence that has now accumulated from the genomic research is plentiful and powerful in clarifying the biological understanding of a number of complex diseases. This information is now rapidly harvested in designing new diagnostic tools and as well as those in making pharmaco-therapeutic decisions and predicting the outcome. In this context, genome-wide measures of gene expression derived from DNA microarray studies has the potential of providing information to the analysis of biological phenotypes . One of the most successful applications of this kind of data includes characterisation of human cancers, including the ability to predict clinical outcomes. Gene expression studies using the microarray genomic technology have been used in defining the broad group distinctions as another mean to define traditional risk factors. However, this approach is less successful in making accurate predictions in individual patients due to considerable heterogeneity within these broadly defined groups. This can be possibly resolved using multiple gene expression patterns and combining this with individual characteristics and predicting outcomes. Thus it is envisaged that combining both genomic and clinical data would most effectively characterise individual patients and provide strong evidence in predicting the clinical outcomes . Several disease groups have attracted the attention of researchers employing a number of genomic approaches. The treatment of cardiovascular disease and cancer is among the top few. In the treatment of cardiovascular disease the current strategies include relying on using a cocktail of drugs of proven efficacy. In some cases, consideration of age, body size, gender and ethnic origin is taken into account in choosing the drug. Most patients benefit from only a few of the five or so drugs that are commonly prescribed. Although positive effects are seen in most, negative side effects are seen in some patients. Examples include a broad range of beta-blockers and statins. Undoubtedly the clinician would welcome any evidence-based approach in selecting the appropriate drug with the maximum efficacy and minimum side effects. Genomic researchers are actively engaged in collecting this kind of evidence and resolving ways in dealing with the complexity of enormous data . Some tentative progress has been made in this direction. Several genetic polymorphisms have been identified that appear to influence the response to pravastatin, one of the several statins currently in use for the treatment of hyperlipidemia . Among these Taq1B polymorphism of cholesteryl ester transfer protein (CETP), which has a key role in the metabolism of high density lipoprotein, has been reported to show a dose dependent correlation with severity of coronary atherosclerosis and predict the response to treatment with pravastatin . Patients with the B1B1 genotype (homozygous for the restriction site for Taq1) demonstrated more severe disease phenotype and responded better to pravastatin compared to those patients who were homozygous with the B2B2 genotype; this observation received support with intermediate response among those with the B1B2 genotype. In the same context, patients with heart failure harbouring the Ile164b2 adrenergic receptor polymorphism demonstrate a more rapid progression of their disease . The presence of this genetic polymorphism arguably alters the function of the receptor as it reduces the binding affinity of the receptor for catecholamines and certain beta receptor antagonists thus reducing the basal and adenyl cyclase activity and agonist stimulated sequestration of the receptor . While these observations and such evidence is exciting, the genetic or genomic data should not be used in isolation but in conjunction with other well established medical and ethical guidelines as part of making therapeutic decisions . Clinical oncology is another field where evidence-based approach has been in practice in defining the clinical outcomes, choosing the chemotherapeutic regimens, and predicting the response to treatment. It is often argued that in some cases the treatment selected is somewhat harsh and aggressive, and on the other hand in some cancers an aggressive approach should be adopted from start to achieve the best possible clinical outcomes. For example, a woman diagnosed with early stage breast cancer will normally undergo surgery for removal of the tumour and then, typically, be treated with adjuvant chemotherapy. It is possible that some of these women could be spared the harsh reality of chemotherapy should reliable tests for better longer-term clinical prediction be available. Traditional clinical risk factors, such as tumour size, patient age, regional lymph node spread and estrogen receptor status are commonly used in predicting the disease progression and the prospects of recurrence. However, information derived from these parameters is often unreliable in identifying patients who will respond better with therapy from others who might end up with poor outcome and recurrences. In the same context, some patients might not require the unpleasant chemotherapy and could be spared from this and avoid unnecessary morbidity. Genomic information, in the form of gene expression profiles within tumour samples together with individual's genomic profile (SNPs and CNVs), has in recent years demonstrated the capacity to identify characteristics that reflect tumour behaviour and that relate to disease progression and outcomes, including cancer recurrence. Tumour-based gene expression data from DNA microarrays adds immense detail and complexity to the information available from traditional clinical and pathological evidence. The gene expression profile in a particular tumour reflects the total somatic gene activity and provides the complex and detailed evidence on both the inherent genetic state of the patient and on the current characteristics of the tumour and disease state . This approach has the potential to group breast cancer patients into high-risk and low-risk categories in the context of long-term recurrences. Patients categorised into high-risk would be likely to have more recurrences and long-term morbidity with probably higher mortality. This type of evidence helps in achieving broad patient stratification that together with traditional clinical risk factors would add tremendous power in making accurate clinically valid predictions . The concept and argument for personalised health care have attracted the maximum attention among the several exciting opportunities that have been explored and discussed. Is it a reality or hype? How far this is a valid option? Above all, what does it actually mean? . These are some of the inevitable questions that have been addressed and argued in numerous reports and publications . Whatever may be the argument in favour or against personalised medicine, this is what is expected by the patient and this is what every clinician is professed to deliver. Starting from the initial days of medical school, all medical students and trainee doctors are taught the art of clinical medicine that includes collecting details of patient's personal and past history in the context of relevant family and social history. This is then put together in the context of presenting symptoms and signs and the outcomes of various radiological and laboratory investigations. Thus the fundamental approach is essentially individualised. So what is different now, in particular following the completion of the human genome sequence and other advances in genome science and technology? For any disease, there is a causative factor, the manner by which the body or a particular organ system reacts to the causative factor, modifying environmental factors, the institution of most appropriate therapy, the outcome to the therapeutic intervention, and the long-term prognosis. All these parameters are intricately related and the outcome in the form of morbidity and health implications is individualised. Essentially every individual carries the inherent biological predisposition to react or behave to a causative factor, the capacity to withstand the unwanted effects of the causative factor, making the best use of the available environmental factors including the pharmacological agents, and contributing to the prevention of progression of the particular disease or disorder. Developments in genetics, in particular human genetics, over the last 50 years have led to recognised medical specialties that are now an integral part of modern health care. Genetic medicine and molecular medicine are interchangeable terms. Both these specialist fields require a thorough understanding of functioning of genes, molecules, metabolic pathways and immunological processes. The practice of medical or clinical genetics is exclusively confined to dealing with the diagnosis, the risk assessment and communication, and to some extent taking part in the management which is largely of preventive nature. The practice of modern medicine in the genome era, which is appropriately called genomic medicine has the advantage of assimilating all that is known so far and as well as the opportunity to acquire information on individual's genomic profile . This is probably more relevant in the context of microbial diseases where the knowledge of genomic profile of the pathogenic organisms (Pathogenomics) can be utilised in establishing the susceptibility or protective ability to the particular pathogen. Systematic analysis of human habitus microbial flora has led to the possibility of profiling the personal microbiome in different body parts and organs . On the other hand genomic profiling can provide the evidence that the individual is more likely to positively or negatively respond to a particular anti-micobial agent. This has been shown in a number of microbial diseases . Perhaps the best application of the genomic evidence would be in non-communicable diseases that commonly result from interaction of multiple causative factors and complex environmental factors. These are also referred to as complex disorders, for example bronchial asthma, diabetes mellitus, coronary artery disease, bipolar depression and some common cancers. The individual genomic profiling, which is now possible with the use of variety of microarrays, can enable identification of individuals who are at higher risk of developing the disease and those who can receive bespoke advice on life-style modification, avoidance of contributing environmental factors, and institution of short-term and long-term pharmacotherapy. 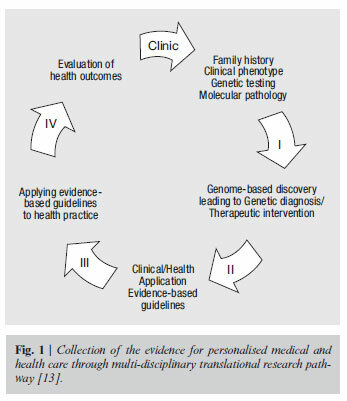 To sum up, "a personalised medicine approach to providing evidence-based health care involves integrating genomics technologies and advances with clinical and family histories in order to more coherently tailor therapeutics to individual patients" . Many of the genes associated with uncommon monogenic diseases encode components of intracellular signalling pathways that regulate complex biological processes such as growth, proliferation, differentiation and survival or programmed death of cells during development and the maintenance of tissues and organs . Mutations that change the function of genes encoding signalling proteins may result in a broad spectrum of human conditions ranging from birth defects to cancer. In some Mendelian disorders the precise knowledge of mutations disrupting or modulating the signalling pathway has led to a better understanding of the underlying pathophysiology. In some cases this knowledge has now offered new opportunities to therapeutically manipulate signalling. This section of the article briefly introduces this exciting development using two such examples. The mammalian target for rapamycin (mTOR) signalling pathway is recognised to be an excellent model for developing targeted molecular therapy in oncology. Numerous mTOR mutations result in the hyperactivation of the signalling pathway and result in multiple tumours that comprise the phenotype of several uncommon Mendelian disorders with increased incidence of hamartomas and cancer (Figure 3). The notable examples include tuberous sclerosis complex (TSC), Cowden disease associated with PTEN gene mutations, Peutz-Jegher syndrome, and disorders associated with RAS/MAPK pathway (type 1 neurofibromatosis, hypertrophic cardiomyopathy and dysmorphic syndromes-Noonan, Costello and Cardio-Facio-Cutaneous). The hyperactivation of mTOR signalling pathway can be inhibited by rapamycin and has been successfully used to treat tumours . Several clinical trials have now been designed, completed and are on-going using the first and second generation rapamycin analogues (mTORC1) and non-rapamycin analogue (mTORC2) inhibitors . Preliminary results of clinical trials using sirolimus, the mTORC1 rapamycin analogue inhibitor, are promising in TSC with significant reduction in the kidney (angioleiomyoma) and lung (pulomonary lymphangioleiomyomatosis) lesions . Sirolimus is now being investigated as a potential treatment for autosomal dominant polycystic kidney disease (ADPKD), the most common hereditary cause of end-stage renal disease. ADPKD is caused by mutations in PKD1 on chromosome 16, encoding polycystin-1 (PC1), and PKD2 on chromosome 4, encoding polycystin-2 (PC2) . Both PC1 and PC2 interact with multiple signalling pathways including mTOR. Inappropriate activation of mTORC1 has been demonstrated in the epithelium lining a proportion of renal cysts from human patients with ADPKD and in multiple rodent models. On this basis, a number of clinical trials using sirolimus have been initiated. ADPKD is now an established ciliopathy where PC1 and PC2 localise to the primary cilia of renal epithelial cells. Several researchers are now engaged in gathering further evidence of mTORC1 activation in disorders associated with primary ciliary dysfunction. It is widely believed that the inhibition of mTORC1 may have therapeutic potential in limiting or preventing renal cyst development and progression in a wide range of ciliopathies . In addition to targeting treating tumours and cysts in Mendelian disorders like TSC and Cowden disease, mTOR inhibitors are now being tested in treating other manifestations such as progressive cognitive decline in TSC. The focus has also tuned to neurodegenerative conditions like Huntington's disease (HD), where deposition of abnormal protein aggregates may contribute to pathogenesis . Inhibition of mTORC1 with sirolimus is mouse models with HD enhanced the clearance of these proteins, possibly by upregulating autophagy and ameliorating behavioural abnormalities . The transforming growth factor beta (TGFβ) family of growth factors regulate many cellular processes such as proliferation, differentiation and survival. Among the many factors that influence the function of TGFβ, interaction between microfibril protein fibrillin-1 encoded by FBN1 gene, allows tightly controlled release of TGFβ . Fibrillin-1 protein contributes to the mechanical integrity of organs and the vasculature. Several pathogenic mutations of FBN1 result in a range of phenotypes that include aortic dilatation/ aneurysm and abnormal arterial vasculature. Rupture of the aortic aneurysm is a major cause of mortality in individuals with Marfan syndrome, the multisystem disorder associated with FBN1 mutations . There is evidence that deficiency of the fibrillin-1 leads to excessive TGFβ activity and promote processes such as matrix degradation contributing to vascular pathology in several monogenic disorders (Figure 4) . Analysis of FBN1 knockout mouse models that develop fatal aortic aneurysms showed upregulation of TGFβ signalling in affected tissue, and treatment of these mice with TGFβ neutralising antibodies reduced aortic root dilatation. TGFβ-neutralising antibodies are not currently available for clinical use in humans. However, another way of reducing TGFβ signalling is to target the angiotensin pathway with a small-molecule angiotensin II type 1 receptor blocker such as losartan, a widely used antihypertensive agent. AT1-receptor blockade decreases TGFβ-mediated intracellular signalling by incompletely understood mechanisms that may involve a direct effect on TGFβ synthesis and modulation of cross-talk between signalling pathways treated fibrillin-1 knockout mice with losartan, the β-blocker propranolol or placebo . The doses of losartan and propranolol were titrated to obtain comparable changes in blood pressure. Propranolol reduced the aortic root dilatation compared with placebo, but losartan completely inhibited aortic root dilatation, and losartan-treated animals were indistinguishable from wild-type controls. In a small-cohort study of 18 patients with Marfan syndrome, treatment with an angiotensin II type 1 receptor blocker was associated with a dramatic slowing in the rate of aortic root dilatation . In light of these promising results, a number of clinical trials of losartan for Marfan syndrome have begun. TGFβ inhibition may have a therapeutic role in a wider range of inherited conditions. Increased TGFβ activity has been implicated in the pathogenesis of the X-linked Duchenne (DMD) and (BMD) Becker muscular dystrophies, caused by mutations in the DMD gene. These conditions are characterised by progressive skeletal muscle weakness and wasting. The more severe Duchenne form is usually fatal by early adult life. Early in the disease both muscle cell death and regeneration are seen, but regeneration slowly fails and fibrogenesis occurs. This process has been linked to increased TGFβ activity. Treatment of DMD knockout mice with losartan resulted in improvement of muscle architecture and function by maintaining muscle regeneration . A search for suitable paradigms for individualised genomic medicine requires a fundamental view of the chief facets of the pathogenic process that is reflected as a disorder or disease. It is not always possible to provide a satisfactory distinction between a disease and disorder. Both are interchangeable terms or likely to be an expression metaphor. A disease can be specific to an organ or related to a particular functional aspect. On the other hand a disorder may involve more than one body systems or organs reflecting in sequence of patho-physiological events all leading to the morbid state. Thus for a disease or disorder to become apparent, there should be a significant disturbance in the body's internal environment or milieu interior. The external factors that are capable for disturbing the internal metabolic environment include diet and microbial infection. The five decades of advances and developments in genetics have provided ample evidence for metabolic and molecular bases of human disease. A number of genes, gene polymorphisms and genomic sequences of unknown functions govern the internal metabolic environment. Thus essentially almost all human disorders or diseases will have some form of direct or indirect genomic bases. Someone argued that all human disorders will have a genetic explanation except for trauma. But this is now discounted as several inherent factors are known to make an individual react in severe pathological manner to mild trauma whilst other person can withstand the impact of severe trauma, such as severe crush injury or burns. The list is endless and rapidly expanding. It is not possible to review all aspects and provide examples. However, the role of diet is looked at in the genomic perspectives, which is fast gaining recognition as a distinct discipline of nutrigenomics . The second major aspect of genomic medicine is pharmacotherapy in the genomic context. The broad term of pharmacogenomics has been used which is appropriately discussed along with pharmacogenetics. These two models are discussed in this review (see previous chapter "Targeted molecular therapy"). 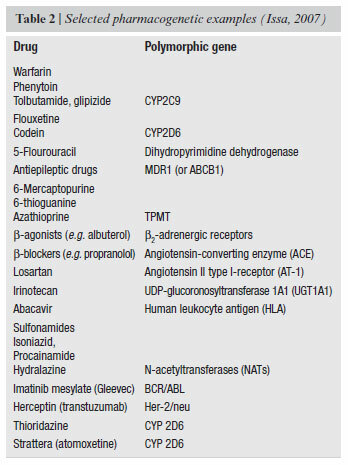 A number of pharmacological agents are now linked to particular gene mutation or polymorphisms that influence an individual's response to the drug (Table 2) . Perhaps the best application of the genomic evidence would be in non-communicable diseases that commonly result from interaction of multiple causative factors and complex environmental factors. These are also referred to as complex disorders, for example bronchial asthma, diabetes mellitus, coronary artery disease, bipolar depression and some common cancers. The individual genomic profiling, which is now possible with the use of variety of microarrays, can enable identification of individuals who are at higher risk of developing the disease and those who can receive bespoke advice on life-style modification, avoidance of contributing environmental factors, and institution of short-term and long-term pharmacotherapy. This brief review draws attention to the importance of evidence-based medicine, an established concept in the practice of modern clinical medicine. The purpose here is to revisit the scope of evidence-based medicine in the rapidly changing medical and health practices following the completion of human and other genomes. The new genome-based technologies and bioinformatics tools offer tremendous power for revolutionising the diagnosis and therapy in a number of human diseases. The genome-based evidence, made accessible to clinicians and health professionals, is robust, accurate and individualised or narrowed down to the small patient population groups. The future of medicine and public/population health looks promising as new opportunities shall emerge from powerful genomic technologies and pharmaco-therapeutic agents. The future clinicians and health professionals will need to be equipped with knowledge and skills in applying broad range of genomic-based diagnostic and therapeutic tools. The transition from the present day conventional evidence-based approach to genomic-based evidence approach is in process leading to genomic medicine. The practice of evidence-based medicine including health promotion and prevention of disease, stands at a critical juncture as the scientific and medical community embrace itself with the rapidly expanding and revolutionising field of translational genomic research. It is essential that this approach should be patient centric rather than the disease centric directed by individual patient's medical, cultural and spiritual requirements . Based on author's presentation "Evidence-based Medicine and Translational Research" at the symposium "Emerging complexity in medicine: how to translate the new scientific advancements into better patients' care" organized at the Istituto Superiore di Sanità, Rome, Italy, 12-13 April 2010. 1. Evidence based medicine: what it is and what is isn't. (Editorial). BMJ 1996; 312:71-2. 2. Evidence-Based Medicine Working Group. Evidence-based medicine: a new approach to teaching the practice of medicine. JAMA 1992;268:2420-5. 3. Evidence-based medicine. (Editorial). Lancet 1995;346:1171-2. 4. Davidoff F, Haynes B, Sackett D, Smith R. Evidence based medicine: a new journal to help doctors identify the information they need. BMJ 1995;310:1085-6. 5. General Medical Council (UK). Education committee report. London: GMC; 1994. 6. Haynes RB. What kind of evidence is it that evidence-based medicine advocates want health care providers and consumers to pay attention to? BMC Health Serv Res 2002;2:3-9. 7. Go VLW, Nguyen CTH, Harris DM, Lee W-N. Nutrient-gene interaction: metabolic genotype-phenotype relationship. J Nutr 2005;135:3016S-20S. 8. Issa AM. Personalized medicine and the practice of medicine in the 21st century. McGill J Med 2007;10(1):53-7. 9. Sackett DL, Strus SE, Richardson WS, Rosenberg WMC, Haynes RB. Evidence-based medicine: how to practice and teach EBM. 2. ed. Edinburgh: Harcourt Brace; 2000. 10. Donaldson LJ, Donaldson RJ. Essential public health. 2. ed. (revised). Reading: Petroc Press; 2003. p. 204-6. 11. Go VLW, Wong DA, Wang Y, Butrum RR, Norman HA, Wilkerson LA. Diet and cancer prevention: evidence-based medicine to genomic medicine. J Nutr 2004;134:3513S-3516S. 12. Contopolous-Ionnidis JP, Ntzami E, Ionnidis JP. Translation of highly promising basic science research into clinical applications. Am J Med 2003;114:477-84. 13. Khoury MJ, Gwinn M, Yoon PW, Dowling N, Moore CA, Bradley L. The continuum of translation research in genomic medicine: how can we accelerate the appropriate integration of human genome discoveries into health care and disease prevention? Genetic Med 2007;9(10):665-74. 14. Nevins JR, Huang ES, Dressman H, Pittman J, Huang AT, West M. Towards integrated clinico-genomic models for personalized medicine: combining gene expression signatures and clinical factors in breast cancer outcomes prediction. Hum Mole Genet 2003;12:R153-R157. 15. West M, Ginsburg GE, Huang AT, Nevins JR. Embracing the complexity of genomic data for personalized medicine. Genome Res 2006;16:559-66. 16. Jukema JW. Matching treatment to the genetic basis of (lipid) disorder in patients with coronary artery disease. Heart 1999; 82:126-7. 17. Kuivenhoven JA, Jukema JW, Zwinderman AH, et al. The role of a common variant of the cholesteryl ester transfer protein gene in the progression of coronary atherosclerosis. N Eng J Med 1998;338:86-93. 18. Liggett SB, Wagoner LE, Craft LL, et al. The Ile164 beta2-adrenergic receptor polymorphism adversely affects the outcome of congestive heart failure. J Clin Invest 1998;102:1534-9. 19. Wilkins MR, Roses AD, Clifford CP. Pharmcogenetics and the treatment of cardiovascular disease. Heart 2000;84:353-4. 20. van de Vijver MJ, He YD, van'T Veer LJ, Dai H, et al. A gene expression signature as a predictor of survival in breast cancer. New Eng J Med 2002;347:1999-2009. 21. Ramaswamy S, Tamayo P, Rifkin R, Mukherjee S, Yeang C, et al. Multiclass cancer diagnosis using tumor gene expression signatures. Proc Natl Acad Sci USA 2001;98:15149-54. 22. Carlson B. What the devil is personalized medicine? Biotechnol Healthcare 2008;5(1):17-9. 23. 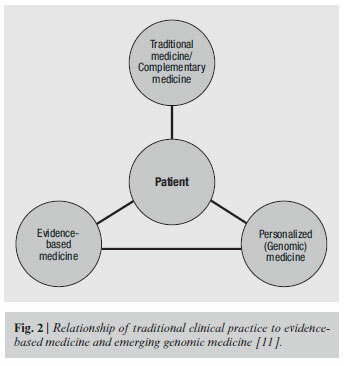 Kumar D. Genomic medicine: a new frontier of medicine in the twenty first century. Genomic Med 2007;1&2:3-7. 24. Costello EK, Lauber CL, Hamady M, Fierer N, Gordon JI, Knight R. Bacterial community variation in human body habitats across space and time. Science 2009;326:1694-7. 25. Peacock C, Jamiesson S. Infectious diseases: susceptibility, resistance, response, and anti-microbial therapy. In: Kumar D, Weatherall D (Ed.). Genomics and clinical medicine. New York: Oxford University Press; 2007. 26. Davies DM, Sampson JR. Small-molecule signal-transduction inhibitors: targeted therapeutic agents for single-gene disorders J Med Genet 2010;47:145-9. 27. Choo AY, Blenis J. TORgetting oncogene addiction for cancer therapy. Cancer Cell 2006;9:77-9. 28. Furic L, Livingstone M, Dowling RJO, Sonenberg N. Targetting mtor-dependent tumours with specific inhibitors: a model for personalized medicine based on molecular diagnoses. Curr Oncol 2009;16(1):59-61. 29. Davies DM, Johnson SR, Tattersfield AE, Kingswood JC, Cox JA, McCartney DL, Doyle T, Elmslie F, Saggar A, de Vries PJ, Sampson JR. Sirolimus therapy in tuberous sclerosis or sporadic lymphangioleiomyomatosis. N Engl J Med 2008;358:200e3. 30. Grantham JJ. Clinical practice. Autosomal dominant polycystic kidney disease. N Engl J Med 2008;359:1477e85. 31. Tobin JL, Beales PL. Restoration of renal function in zebrafish models of ciliopathies. Pediatr Nephrol 2008;23:2095e9. 32. Gil JM, Rego AC. Mechanisms of neurodegeneration in Huntington's disease. Eur J Neurosci 2008;27:2803e20. 33. Ravikumar B, Vacher C, Berger Z, Davies JE, Luo S, Oroz LG, Scaravilli F, Easton DF, Duden R, O'Kane CJ, Rubinsztein DC. Inhibition of mTOR induces autophagy and reduces toxicity of polyglutamine expansions in fly and mouse models of Huntington disease. Nat Genet 2004;36:585e95. 34. Jones JA, Barbour JR, Stroud RE, Bouges S, Stephens SL, Spinale FG, Ikonomidis JS. Altered transforming growth factor-beta signaling in a murine model of thoracic aortic aneurysm. J Vasc Res 2008;45:457e68. 35. Ramirez F, Dietz HC. Marfan syndrome: from molecular pathogenesis to clinical treatment. Curr Opin Genet Dev 2007;17:252e8. 36. Zhang GY, Li X, Yi CG, Pan H, He GD, Yu Q, Jiang LF, Xu WH, Li ZJ, Ding J, Lin DS, Gao WY. Angiotensin II activates connective tissue growth factor and induces extra-cellular matrix changes involving Smad/activation and p38 mitogen-activated protein kinase signalling pathways in human dermal fibroblasts. Exp Dermatol 2009;18:947e53. 37. Brooke BS, Habashi JP, Judge DP, Patel N, Loeys B, Dietz 3rd HC. Angiotensin II blockade and aortic-root dilation in Marfan's syndrome. N Engl J Med 2008;358:2787e95. 38. Cohn RD, van Erp C, Habashi JP, Soleimani AA, Klein EC, Lisi MT, Gamradt M, Rhys CM, Holm TM, Loeys BL, Ramirez F, Judge DP, Ward CW, Dietz HC. Angiotensin II type 1 receptor blockade attenuates TGF-beta-induced failure of muscle regeneration in multiple myopathic states. Nat Med 2007;13:204e10. 39. Hunter P. Reading the metabolic fine print: The application of metabolomics to diagnostics, drug research and nutrition might be integral to improved health and personalized medicine. EMBO Rep 2009;10(1):20-3. 40. Miles A. On a medicine of the whole person: away from scientistic reductionism and towards the embrace of the complex in clinical practice. J Eval Clin Practice 2009;15:941-9.